Welcome to the MailChimp Dashboard. So you can take a quick tour of your DashBoard .Click on the Next button in the tour popup that appears. 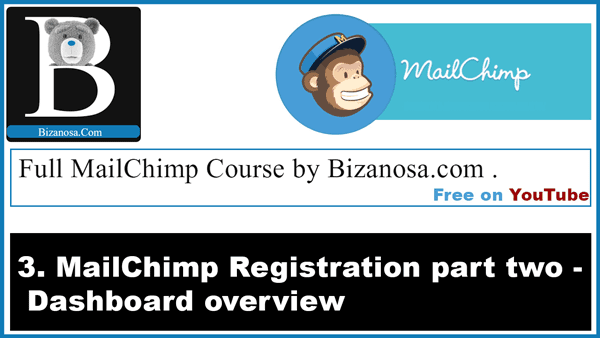 That will guide you through a general overview of MailChimp. So if you want to view settings that are specific to your account, click on your username. This will reveal more options for you. Links such as Notifications, Profile , Account, Support and Log Out will be revealed. Notifications : An event that happen on your account. You will see a highlight for notifications. You will be notified of successes, fails , subscriptions and un-subscriptions. Check out this Notifications area for any new alerts about your account. Profile : Deals with stuff related to your profile. Change your profile information and details here. Account: Anything that is specific to your MailChimp account will be here. Account users, Account settings, Billing information. Support : If you need to contact MailChimp support click here. Plus other help resources links. Log Out: Enables you to log out of your current session. In short, under your account username you can access the support, your Account settings , your profile and more (all listed above) . Campaigns: All about sending campaigns and newsletters. Campaigns are basically newsletters that you send out to your subscribers. We will cover this last, only after you have become extremely good with all other MailChimp features. Templates: Templates refer to the designs that you actually send out to your subscribers. They are the actual email content and lay outs. You will learn about different kinds of templates. You will create MailChimp templates (no programming knowledge necessary) . Lists: These refer to your subscribers. Here you will be able to create and change setting for your lists. In MailChimp you can have as many lists as you want. For free MailChimp accounts, the subscribers limit is set to 2000 email subscribers. Reports: How are your campaigns performing? Are you getting new subscribers? Are people unsubscribing? Are links being clicked once you send your emails? Does anyone even care about your emails ? Are they getting opened? Automation: This is a paid and awesome feature that will not be covered in this course. We’ll cover all of these except for Automation . So , you can just take a look at everything and familiarize yourself with MailChimp as you wait to watch the next video or the next post. Okay , see you next time. Leave your feedback with any queries and input.